IT’S A THIN LINE BETWEEN ALIVE AND UNDEAD. Chess Putnam has a lot on her plate. Mangled human corpses have started to show up on the streets of Downside, and Chess’s bosses at the Church of Real Truth have ordered her to team up with the ultra-powerful Black Squad agency to crack the grisly case.Chess is under a binding spell that threatens death if she talks about the investigation, but the city’s most notorious crime boss—and Chess’s drug dealer—gets wind of her new assignment and insists on being kept informed. If that isn’t bad enough, a sinister street vendor appears to have information Chess needs. Only he’s not telling what he knows, or what it all has to do with the vast underground City of Eternity.Now Chess will have to navigate killer wraiths, First Elders, and a lot of seriously nasty magic—all while coping with some not-so-small issues of her own. And the only man Chess can trust to help her through it all has every reason to want her dead.From the Paperback edition. Since I read City of Ghosts in September, about 30 seconds after I finished Unholy Magic, I can’t for the life of me understand why I didn’t post my review immediately. So I’m going to make this a quickie. 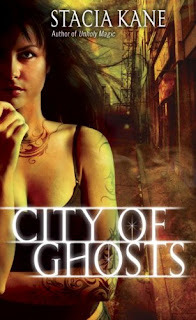 City of Ghosts is the third installment of Stacia Kane’s Downside Ghosts Series. A world where ghosts go bump in the night with the pure intent of doing you harm. As a Debunker and Church Witch, it’s Chess Putnam’s job to make sure that any reports of haunting are investigated to expose fraud or proven legitimate. In which case it’s her job to dispatch the ghost. I’m still in awe over this book. Stacia Kane continues to raise the bar in the Urban Fantasy genre. Everything from her world building, lively characters to slang talk pulls you into the story from page one. The plot as noted above is FANTASTIC! Kane keeps you scratching your head with twists and turns in her plot and just when you think you’ve got the mystery solved – the freight train slams into you. And let’s not forget the completely soul wrenching Chess and Terrible relationship. Kane does NOT disappoint readers. She creates a roller coaster of events that leave you gasping and screaming and swooning as you turn each page. If you haven’t started this series – for the love of puppies and kittens – PLEASE START!! You will not be disappointed. 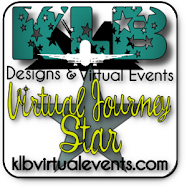 Stacia Kane delivers – book after book after book! I LOVED this series. This book rocked. It was one of my favorites in a while. Thanks for the great review, and if your interested, here's mine! Great review! I just loved this book. It's been awhile since I've read it, but I still remember being blown away by it! Great review! This was definitely one of the most awesome perfect books for me of 2010. I hung on every word and could not put it down from start to finish!!! There were so many gut-wrenching parts that I felt in my chest!